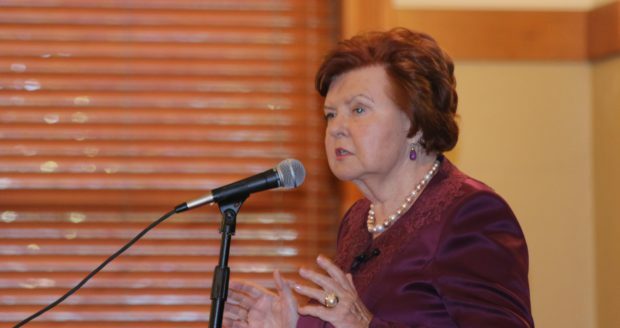 Vaira Vike-Freiberga, the first scholar-in-residence under Barrett, The Honors College’s Distinguished Global Leader Program, dispensed practical advice, world observations and inspiration in a wide-ranging speech Jan. 24 at Arizona State University. Vike-Freiberga, is the former president of the Republic of Latvia (1999–2007) and current president of the World Leadership Alliance/Club De Madrid. She will be a scholar-in-residence at Barrett until March 2. In her talk, which was attended by approximately 300 ASU students, faculty, staff and community members in the Carson Ballroom at Old Main, the former president touched on many themes, including involvement in world affairs, leadership, the women’s movement, and politics. 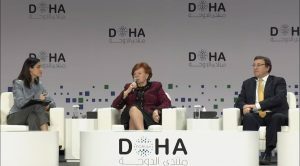 Addressing students specifically, Vike-Freiberga said millennials should not be reticent about getting involved in domestic and world affairs, but rather seek out opportunities to engage locally and globally in meaningful ways. “The decisions you make in life now will affect you all of your life. At the end of your life, hopefully you will have constructed a beautiful and worthwhile life of service to others,” she said. Young people also should not fear change, but strive to find their place in society, as well as their purpose. A good dose of practicality and healthy skepticism also is necessary when engaging with leaders. “Beware of political leaders who make unreasonable promises. Leaders will promise their followers the moon, but won’t give them what’s on the earth. Look for leaders who are practical and grounded in reality,” she said. Vike-Freiberga will continue her residency with events, panel discussions and meetings with students. See her schedule here.